"The full name of the temple, in the Balinese language, is "Pura Taman Ayun", which translates as "Garden Temple in the Water". It is surrounded by a narrow and artificial moat, which is planted with the lotus flowers significant in several Eastern religions. It is also surrounded more distantly by a river, on an island within which it was built. 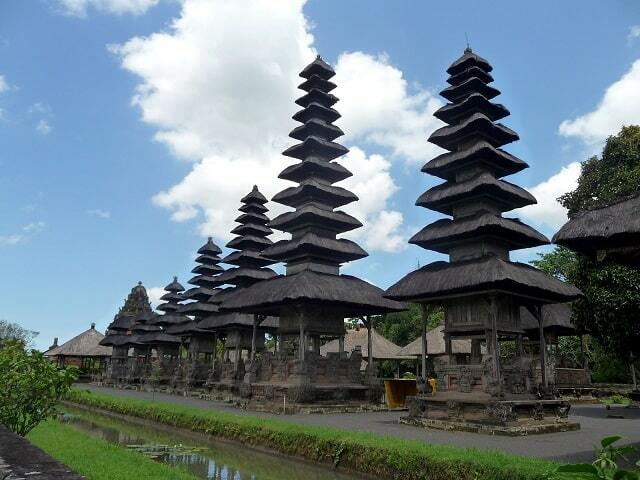 The temple is entered through a traditional Balinese split gate. Gates of this design are common in temples in Bali; it is traditionally believed that if an evil spirit attempts to enter the temple by passing between the two halves of the gate, they will come together and crush the invading spirit." Source from here." 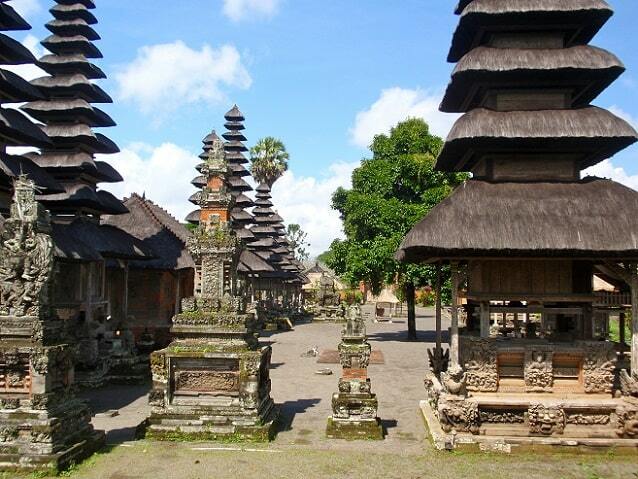 The Pura Taman Ayun is a temple in the village of Mengwi, West of Ubud on Bali. The temple is dedicated to the ancestors of the Princes who ruled over Mengwi until 1892. Pura Taman Ayun was built in 1634 and is located in a water garden with a canals covered with lotus flowers on three sides. The temple is accessible through the main gate (Kori agung) with a statue of Sai. There are various meru towers which stand for the mountains, the home of the gods. The highest meru (at the end; at the right) has eleven floors and stands for the mountain Gunung Batukau. There are also several pavilions. The name Taman Ayun means literally "beautiful garden" and the temple is generally considered as one of the most attractive temples of Bali. Taman Ayun is set in a beautiful park with trees and ponds in the South of Bali at Mengwi, about 5 miles South West of Ubud and 18 km northwest of Denpasar. Pura Taman Ayun is an easy stop on a drive to/from the Jatiluwih rice terraces. 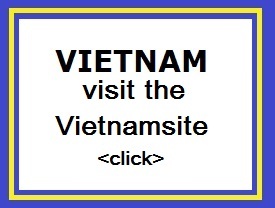 It is also a stop-off on many organised tourist tours. The temple forms part of the subak system (village association for rice-growers) of sites recognised by Unesco in 2012. Pura Taman Ayun was built in 1634 by the Raja of Mengwi, I Gusti Agung Putu. It is called a "Pura Kawiten" or "family Temple", a special temple, where the deified ancestors of the Raja dynasty of Mengwi and important gods of other temples are worshiped. The temple is surrounded by wide canals and this can only be reached by a bridge. The bridge leads to a richly decorated ' candi bentar ', the main gate, giving access to the outer courtyard (Jaba) of the temple. From the "Candi bentar" a staight, hardened walking trail leads you through a well-maintained park along a square pond with a fountain in the middle. This fountain has nine water jets, four of them are posted at important points, another four at something less important points. The ninth state is standing in the middle. They symbolize the Dewa Nawa Sanga: the nine most important gods of Balinese Hinduism. The trail leads to a second "Candi bentar". 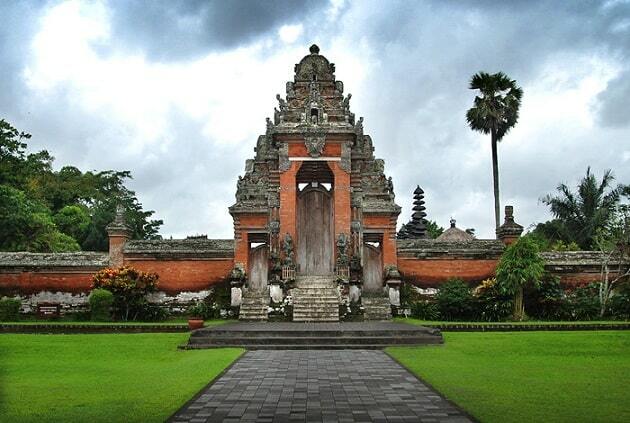 This gateway brings you to the "Jaba Tengah", the more exalted, second courtyard of the temple. Inside the Jaba Tengah is the walled "Jaba Jero", the third and most sacred courtyard of the temple, in which are the main shrines located. Among others several Meru towers with five, seven, nine and eleven roof-floors. The Meru towers couples stand for mountains, the home of the gods. The highest Meru has eleven floors and stands for the mountain Gunung Batukau. The "Jaba Jero" is only accessible during important religious ceremonies, such as the ' Odalan ' (the day, when the inauguration of the temple is remembered).